SINCE establishing Corella Construction four years ago, Craig and Ella Brown have delivered and renovated a multitude of homes on time and within budget across Brisbane. Corella Construction specialises in updating Queenslander homes to the highest standard while remaining faithful to the Queenslanders tradition. Corella's portfolio includes renovating a pre-1946 Ashgrovian Queenslander in Bardon into a superb residence, complete with an indoor lift and resort-size glass and concrete pool that has to be seen to be believed. This outstanding renovation included lifting, restumping and reconfiguring the existing dwelling to extend existing levels, as well as the addition of a spectacular third level. The result is a Hamptons-style build with uniquely Queensland touches. "The lift shaft is very intriguing, given that you don't often see the mechanical workings of a lift in a residential home," says Ella. "It could have ended up looking quite industrial, but it works with the traditional fitout of the Queenslander." "The tiling is most impressive, with mosaic tiling features throughout the house and the pool, and the lift shaft is finished with subway tiles to provide clean lines that fit in with the traditional feel." 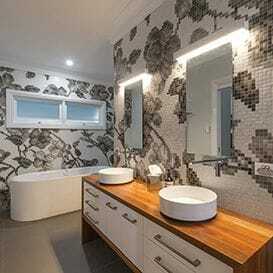 Corella Construction took tradition to another level again with its recent Indooroopilly project. Another western suburb known for its old-school charm, the new build looks at home in leafy surroundings steeped in tradition. In keeping with character of the homes in the area, the front of the house was built in an old, traditional style. "This was a very unusual project in its blended approach for a new build. The client loved old styles as much as contemporary styles, so the home was all about finding a blend between the two," says Ella. "About halfway into the house, everything takes on a completely modern feel. I love the design and the glass expanse at the back of the house - something that changed during the course of construction to adapt to the client needs." Both the Bardon and Indooroopilly projects were delivered in nine months almost simultaneously the view from the top well worth it, soaking in the Brisbane river from an Indooroopilly cliff face and the city skyline from a Bardon masterpiece.